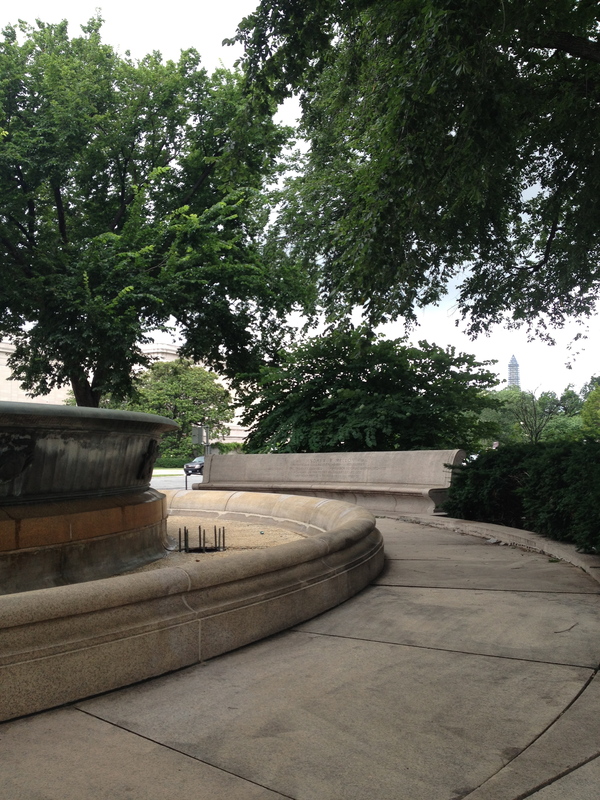 While walking the other day, we paused to take note of this tucked away fountain at Pennsylvania Avenue and 6th Street, NW. 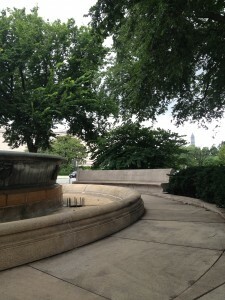 As the inscription in the surrounding stone seating describes, the Andrew W. Mellon Memorial Fountain honors the “Financier, Industrialist, Statesman” who was the Secretary of the Treasury (1921-1932), Ambassador to Great Britain (1932-1933), and the founder of the National Gallery of Art (located across the street from the fountain) in 1937. The fountain was dedicated in May 1952 by President Harry S. Truman and was designed by Paul Manship and Sydney Waugh. This fountain is a popular place for people to hide stuff in the bushes.